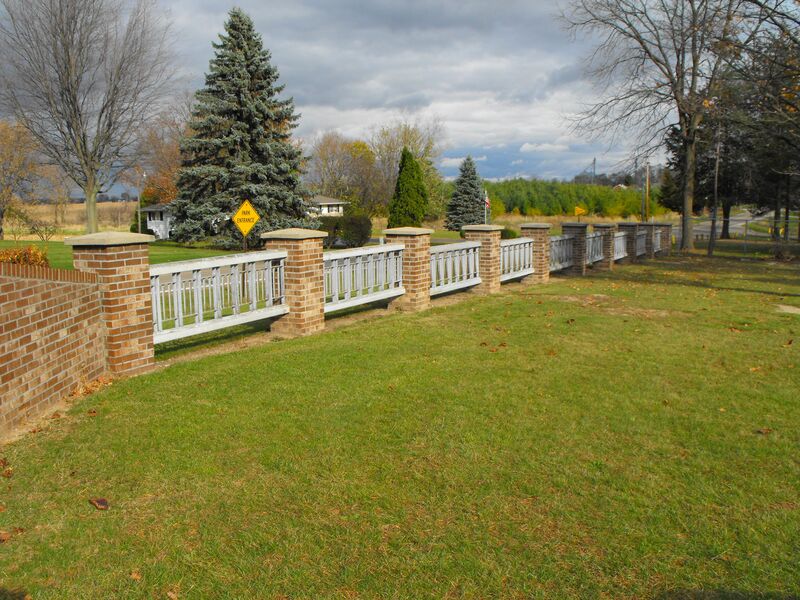 What Are Michigan's R4 Railings? 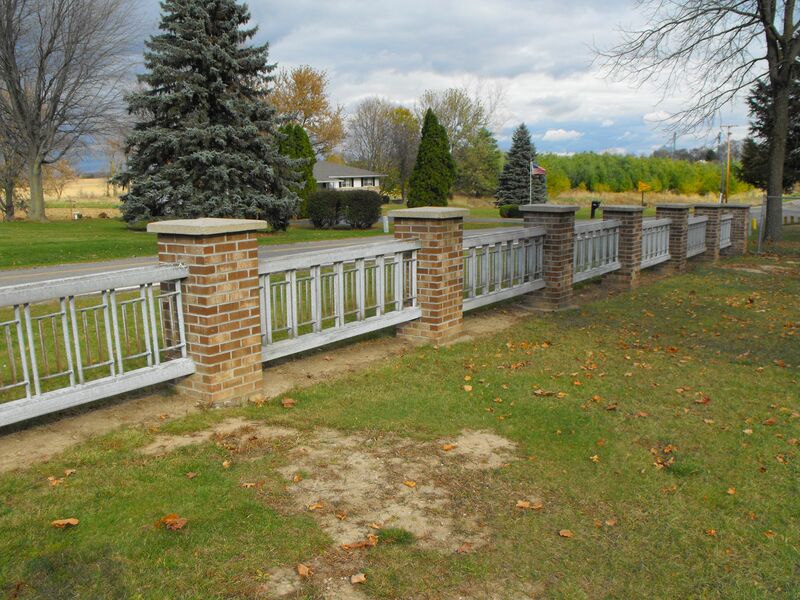 There is perhaps no other single element that more vividly defines bridges in Michigan than the railing design that was classified by the Michigan State Highway Department as the R4 railing standard. The railing design is identified by its distinctive metal railing panels which are separated by concrete or metal posts which generally conform to a few different designs. The first bridges to use the R4 railing design were constructed in 1932, and the design was used for several decades, up to around 1964. The design is noted for its aesthetically appealing design which helps make even the most mundane stringer bridge or even an early pre-stressed concrete box beam bridge look nice. 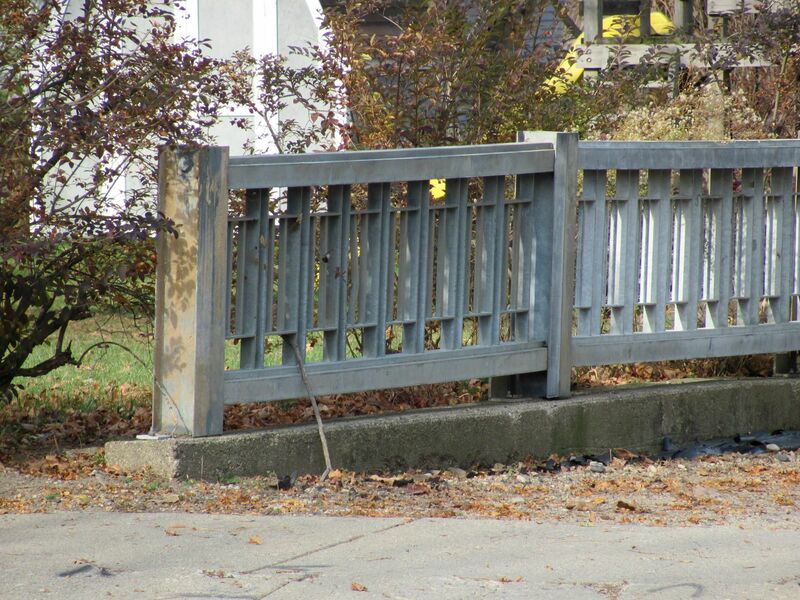 Many states chose to adopt plain function-only railing designs for their bridges during this period in history, and as such, thanks to the R4 railing, many of Michigan's mid-20th Century bridges are much nicer looking that comparable structures found in other states. The R4 railing traces its roots back to not only a standard for railings, but also to a couple different standards for bridges. Between the small period between 1927 and 1932, Michigan built a large number of steel stringer bridges according to a unique standard plan. The old plan included stringers with a unique concrete balustrade railing design and a decorative concrete encasement over the outermost stringer (fascia beam) to give the bridge an overall appearance of a concrete bridge when it was in fact a steel stringer. An example of this design is shown to the right. Quite abruptly in 1932, a transition was made away from this design however. The concrete balustrade railing bridge design was abandoned for a new steel stringer design which began the use of R4 railings. 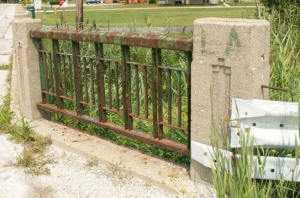 The very first bridges built with R4 railings on them were constructed in 1932 and possibly 1933. These first bridges are unique and demonstrate the transition that was being made. These bridges contain R4 railings, but yet still feature a concrete encasement on the fascia beams as seen in the concrete balustrade plan bridges. 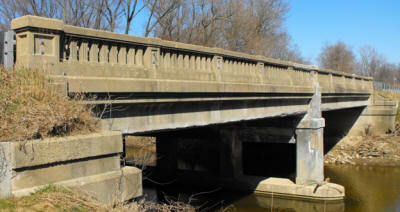 The Berry Road Bridge is an exceedingly rare example of this transition design, which also is the oldest known. As early as 1934 however the concrete encasement was no longer being used, and never would be again on Michigan steel stringer bridges. 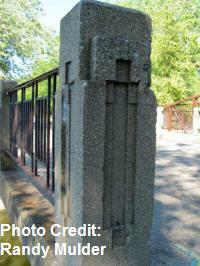 This rare bridge design documents what appears to be the earliest example of the R4 railing design. The R4 railing design did not stay confined to individual standard plans for steel stringer bridges however, and almost immediately was adopted as a railing design that could be applied to anything, from railroad overpasses, to rigid frame bridges, as well as continuing to be used on steel stringer bridges. This became the destiny of the R4 railing: the railing that could be used for anything. 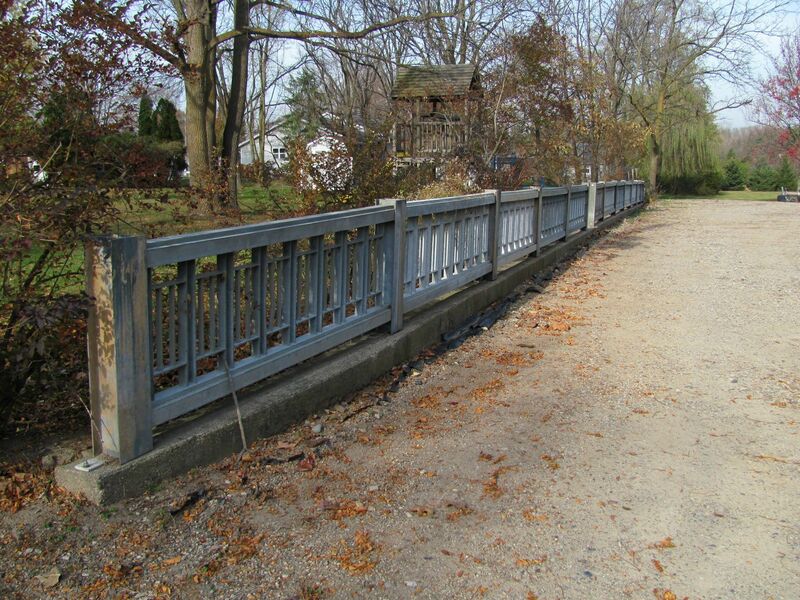 It is worth noting however that although R4 railings quickly became the most popular railing for bridge construction in Michigan by far, a number of additional standard railing plans existed in Michigan alongside the R4 standard and were used as well. The original metal railing panel design for the most part remained the same in terms of design throughout the history of the R4 railing with the exception of some variation in panel length. There were some variations that were used for specific situations, such as for pedestrian bridges. 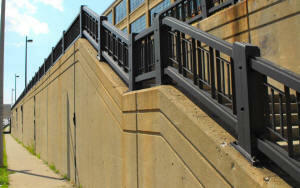 The earlier R4 metal railing panels were made of painted steel, while the later R4 metal railing panels were galvanized. Perhaps the area of greatest variation in the R4 railing systems was with the railing posts. 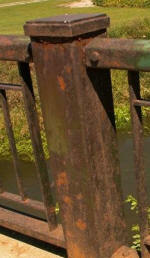 There were several different railing post details that were used over the history of the railing. There was always a choice between a concrete post and a metal post. A few different architectural details for each of these post types has been identified, although only three of the architectural detail designs were widely used. These all will be discussed below. The first generation R4 railings, used in the 1930s bear specific mention because during this period a specific architectural detailing was used for the concrete railing posts during this period. This detailing was only used for this first decade and was not used at all after this period. In addition, the other architectural details which would be used on the concrete posts in later years do not appear to have been created yet during this period. The design of the concrete posts from this period have an Art Deco styling to them, with the top of the posts being slightly stepped, and the face of the posts having an inset design consisting of a center vertical line flanked by a single shorter vertical line on either side. The Ojibway Island Bridge is a good example of a restored bridge with this railing design. 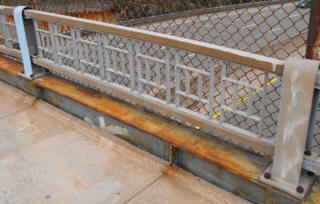 The railings on the Ojibway Island Bridge were galvanized as part of the restoration. 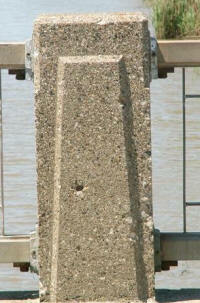 After the first generation of concrete posts ended, the main era of the R4 railing came to bear in 1940. The introduction of a new plan set for the R4 railing in 1940 appears to have brought about the end to the old concrete railing post. 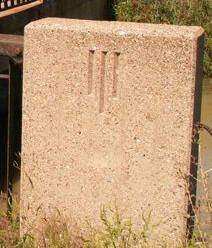 The new concrete railing post featured a square post with an inset keyhole shape on the face. A companion metal post with a similar keyhole design was also made available on these plan sheets. 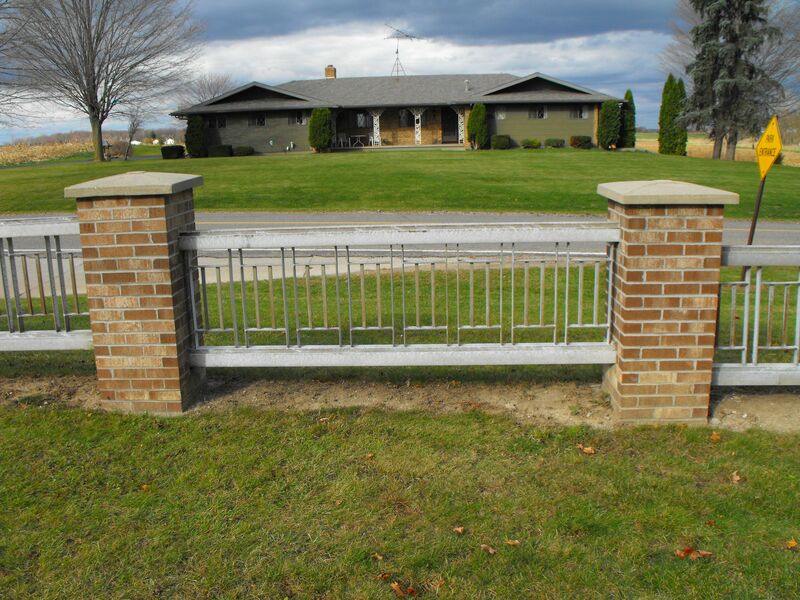 However, as far as metal posts are concerned, the keyhole design was not as popular as another design where the square metal posts had three metal strips attached to the faces of the posts in a pattern similar to the first generation concrete posts. 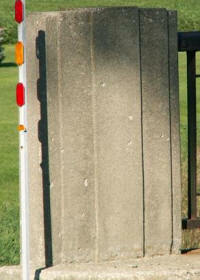 Unfortunately, these metal posts with the strips of metal on them proved to be a poor design. Over time, pack rust forms between the strips and the actual post, and the strips will bow out and/or break off. Many bridges today with the metal posts are missing a large number of their strips. See comparison below. 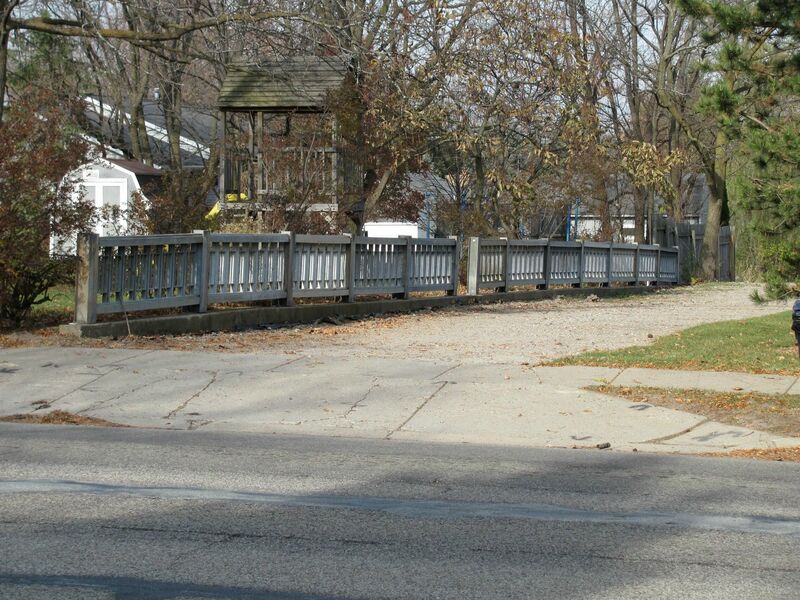 The Riverside Park Drive Bridge in Grand Rapids is an unassuming little bridge that may have been what inspired the Michigan State Highway Department to develop the R4 standard. With a given construction date of 1930, before the R4 standard was developed, the bridge has railings that are different but extremely similar to the first generation R4 railings. 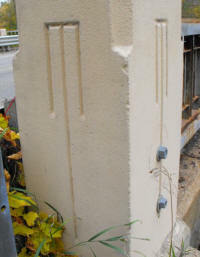 The concrete posts, while narrower, have the same inset architectural detailing on the faces. The metal panels are significantly different in construction and proportions and are very lightweight, but the overall architectural arrangement of the parts is the same. It is assumed this bridge was built by the city, since it is located in a park. 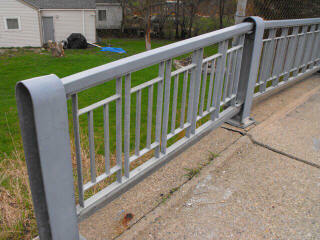 The City of Grand Rapids unfortunately does not retain plans for this bridge however. It may never be known, but it seems possible that this bridge may have inspired the R4 railing standard. Below are technical drawings that show the exact design and layout of the R4 railing. 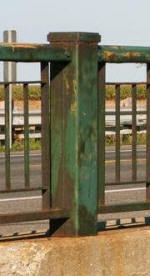 There are a few variations in the posts used for the R4 railing system that have been found on some bridges. It is not known why the designer chose to break from the traditional choices, but these variations are a welcome diversion from the normal. Three examples are shown below. Note that the one on the far left also has slightly different railing panels where the horizontal tubes are square shaped and do not have the stepped design defined in the official standard plan. 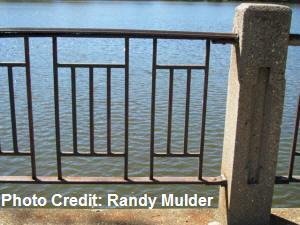 There also were some variations made to the railing design for bridges that included stairways. Changes made included adjusting the metal panels to run on an angle. Also, on some stairway railings, the top horizontal tube was redesigned to provide a smoother surface that was more comfortable to hold on to, shown in the photo to the right below. There were also some variations on the R4 design used on pedestrian overpasses for freeways. Changes included metal posts with a rounded top, and square horizontal tubes as opposed to the traditional stepped square design. Approach walkways had railing with slightly different proportions from the standard R4 and railings on the main overpass bridge were much shorter and as such have very different proportions. Examples are shown below. Finally, it is worth noting that the general architectural style of the R4 railing is not found in any other state in the United States. A similar railing in Canada will be discussed later. One exception is on the Anthony Wayne Suspension Bridge in Toledo Ohio, which has a railing that seems inspired by the R4 design, perhaps a result of Toledo being so close to Michigan. 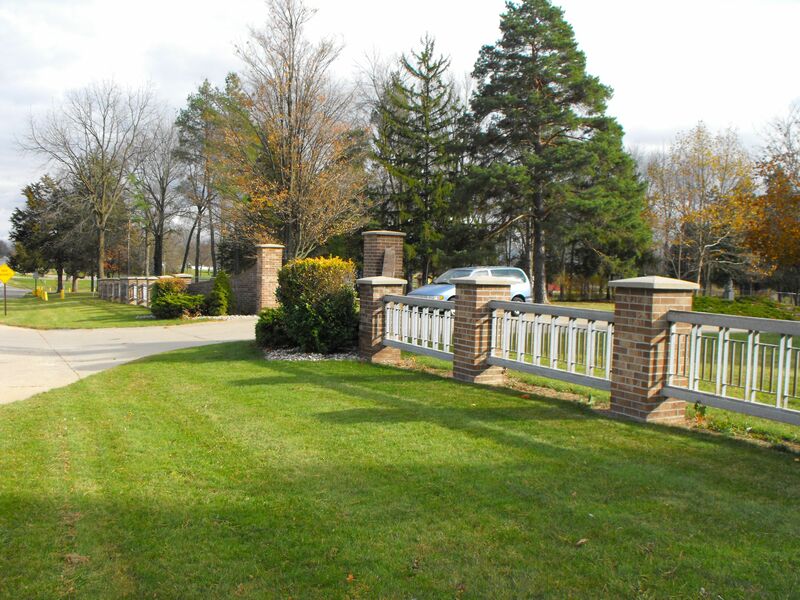 The Anthony Wayne railing is shown below. 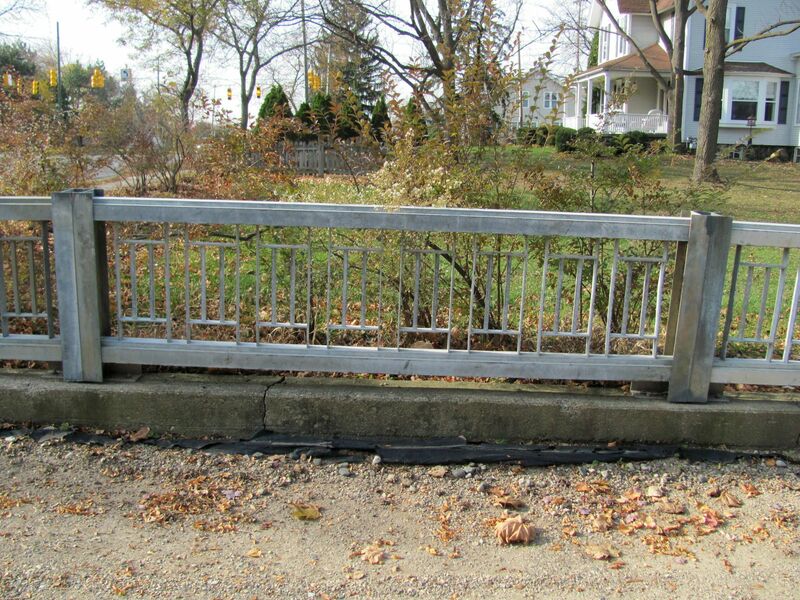 The beauty and durability of the R4 railing has caused these railings to occasionally be salvaged from bridge replacement projects and reused for non-bridge purposes. 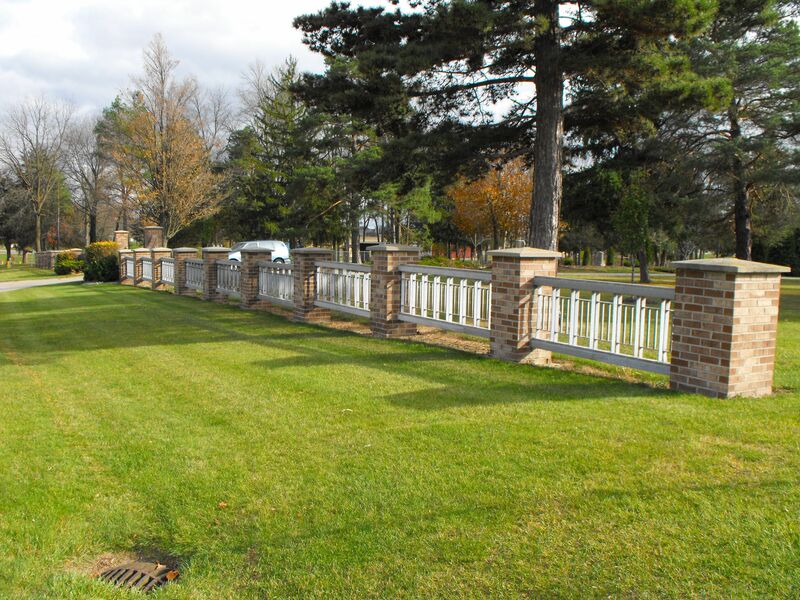 These R4 railing panels were found acting as a decorative fence and gateway into the cemetery at Westphalia, Michigan. It is not known what bridge these panels came from. The Wild Goose Inn is a bed and breakfast in the heart of East Lansing that has surrounded its property with R4 railing, including some nicely preserved metal posts. 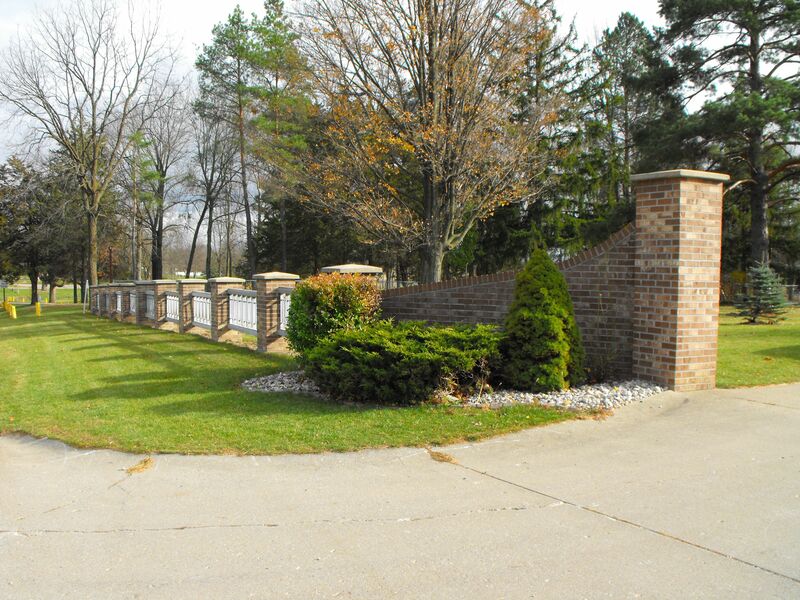 This property has lined one side of its driveway with R4 railing panels, attached to non-original rolled wide flange beams. The province of Ontario and the state of Michigan have one thing in common besides the fact that they are neighbors. Both extensively used similar bridge railings during the same period of history. Ontario, like Michigan, had its own "R4" design although they likely had a different classification and name for the railing. 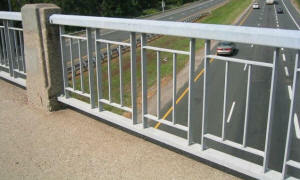 Ontario, like Michigan, used this railing design extensively on a wide variety of bridge types. 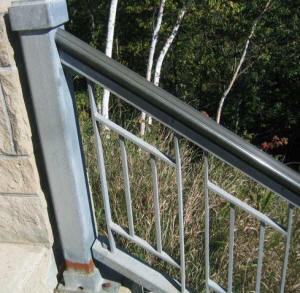 The railing design actually was used in a number of Canadian provinces, particularly in provinces west of Ontario, although Ontario seems to have used the railing design most extensively. Canada's metal railing panels have a somewhat different design from Michigan's. The proportions of the elements that form the design are slightly different. Also, not all railing panels in Canada have the same proportions. Some are taller, some have the interior elements spaced further apart, etc. Also, the top metal horizontal tube has a shaped design with a smooth top surface, quite different from the sharp corners of Michigan's stepped, square-shaped design. 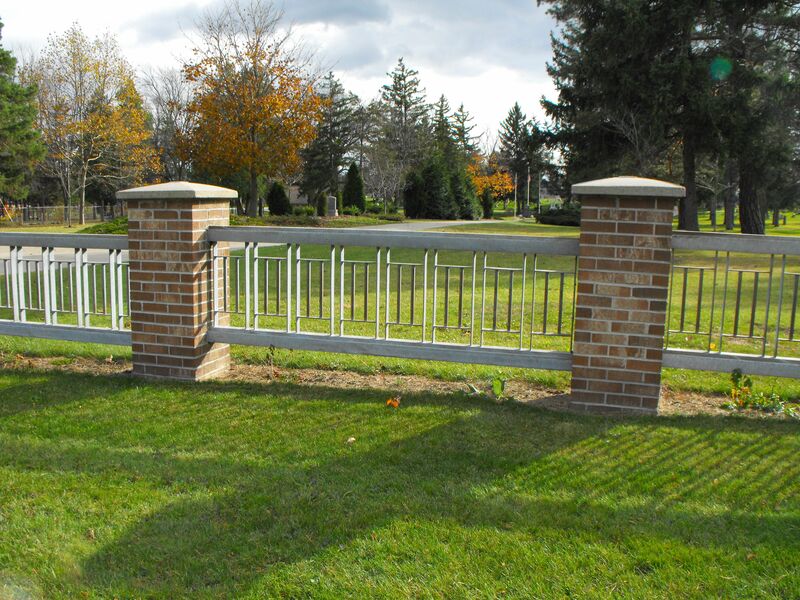 Like Michigan, Canada used a variety of railing posts, including both metal and concrete, however the Canadian designs for both are unlike those used in Michigan. There are two common designs in Canada, one a metal design the other a concrete design The common metal design in Canada is a simple square post with a cap on top. 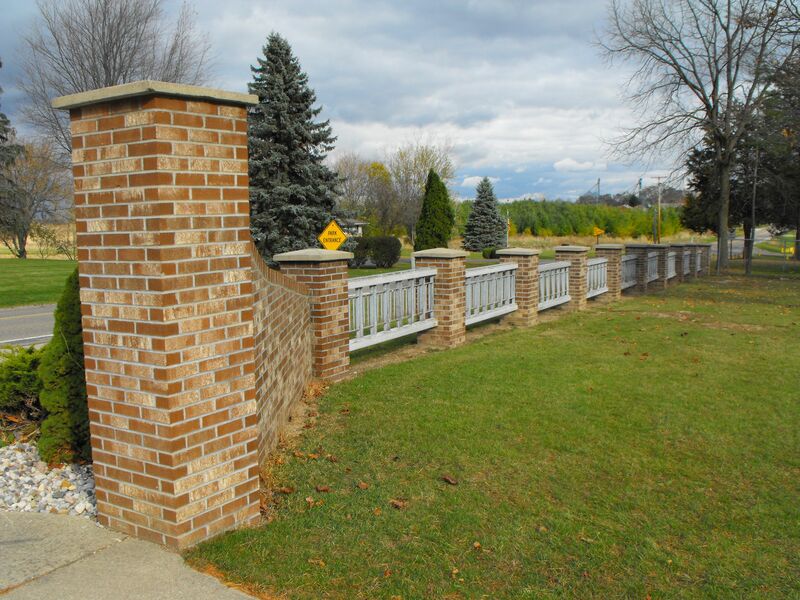 The common concrete post is often a simple square post with three short parallel incised lines toward the top of the post faces. The end post may have a more elaborate shaped design. 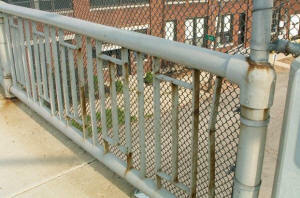 Despite these differences however, the similarities between these railings in Canada and Michigan is quite striking. With Ontario and Michigan being neighbors, one cannot help but wonder if there is a connection. It appears their may be a connection. 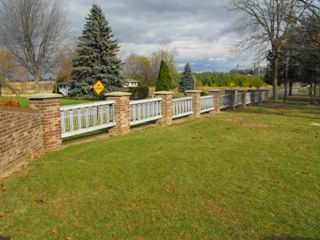 Perhaps the most suggestive of a connection between the railings of Michigan and Canada is the Whitebread Line Bridge in Lambton County, Ontario. 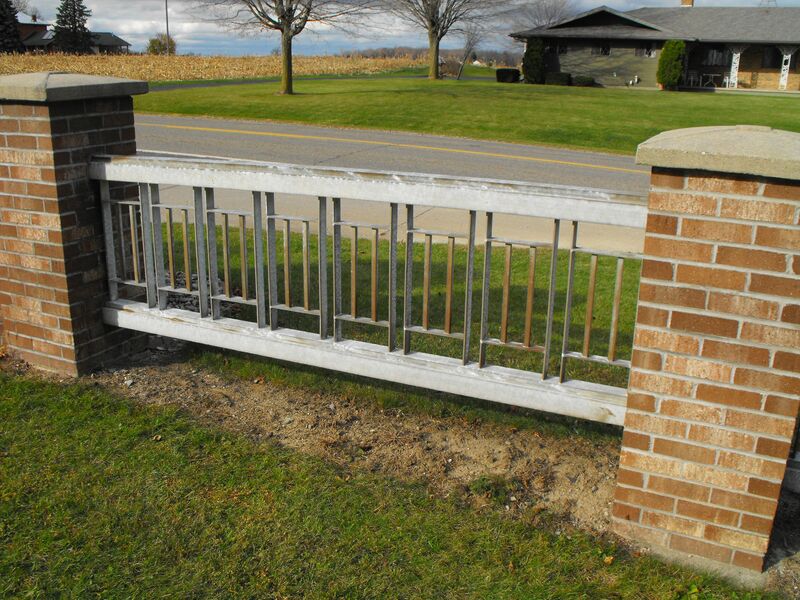 Literally less than two miles from Michigan soil, this Ontario bridge has typical Ontario metal railing panels, however what is unusual about this bridge is the concrete railing posts. 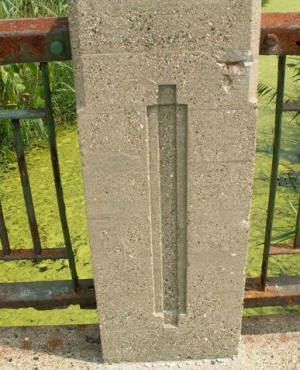 The posts on the Whitebread Line Bridge are nearly identical in design to Michigan's first generation R4 railing posts. These posts have everything, including the inset three line design, and even the slightly beveled edges on the topmost portions of the post.